I’m not on Twitter, but if I were . . . 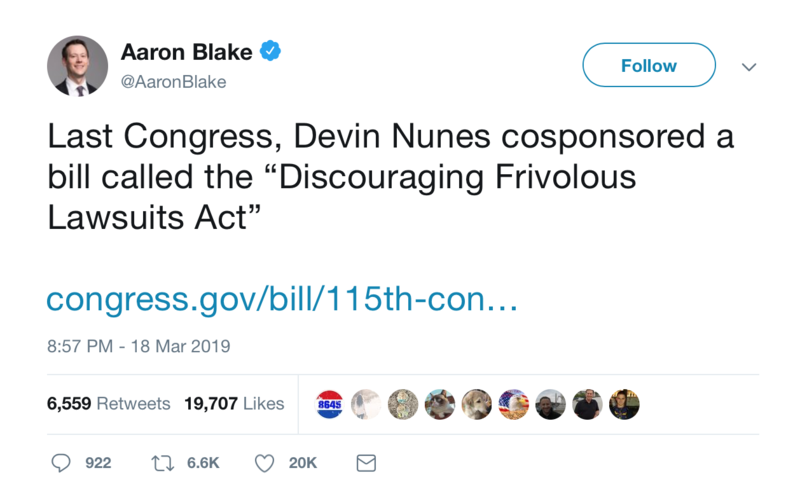 This is how politics and humor now play out in the strange world of social media..The parody account @DevinCow had only 1,200 followers on Monday, but it ended Wednesday afternoon with 467,000, surpassing Mr. Nunes’s accountwith its 395,000 followers. And the count was still growing. Justice Thomas recently opined that public figures should not be treated differently from private individuals. In other words, Nunes' suit might be a fishing expedition for a SCOTUS challenge. "Devin Nunes Receives $4.5 Million From Donor On Condition He’ll Just Retire On It And Never Show His Face Again"
It's not just dead. It's 6 feet under and decomposed. Eh. There've been way funnier parody accounts on Twitter. Italian Elon Musk was amazing, for example. Especially because the person who did it used their main account for it and lost their blue checkmark because of it. Not surprised our boy Hick said something realllly stupid on the teevee. He ain’t presidential, and rather than inflicting his stupidity on the nation, he should find something else to do. Cheer up, Sappy….. As long as Hick remains in the race, it is less likely that Senator-For-Life You-Know-Who will get into the presidential race. Besides, the more centrists running, the more votes pulled away from Biden, and the better the chances of some LWNJ getting the nomination. Sigh. So my hopes ride with a guy who will be 78 on election day? Sadly, mine too. But if the stuff in the NY Times is reliable, he is looking at possibly declaring himself a one-termer and rolling out his VEEP early. Maybe it will be Amy. Speculation I saw was Biden/Stacey Abrams. Axios, NY Magazine, Washington Examiner … lots of others. Hmmm…. interesting. In the old days, her lack of experience (beyond the state legislature) would have taken her out of consideration. After 2016, that is no longer a disqualification. WOTD via Brad DeLong: "How to Pay for the Green New Deal"
Cheer up ‘V, it could be worse, you could be pinning your hopes on one of Alva’s IT people? The horror, Dio, the horror. I'm having major difficulties posting, as I gather you are. Can you make it through the day without me hectoring you? It’ll be a challenge, but I’ll struggle through, I’m sure. But, I have absolutely no idea how all the much less fortitudinous of Alva’s minions here will survive??? . . .
Vox could only find 3 key takeaways from John Hickenlooper’s town hall.